Modern rugs have a place in any home, apartment, office, or store. The aesthetic function of modern rugs depends on your level of investment and chosen style, yet the practical function relies heavily on proper placement. Interior decorators know there are right and wrong ways to implement modern rugs. Consider the following suggestions. Some products serve impulse shoppers well, but modern rugs are not such products. Proper placement and size is integral. Before perusing our online site, take the time to measure your available space. To take measuring the space a step further, place sheets of paper on the floor, emulating the intended look of a rug. Do this a series of times, trying different sizes in the available space. 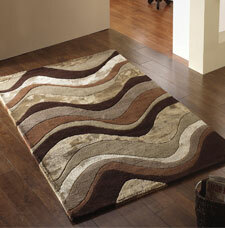 Minute details can create difficulties regarding placement of modern rugs. For instance, is your intended purchase too thick for near-door placement? Do you rearrange furniture in a particular room according to season? Do some rooms in your living space experience more foot traffic than others? These are questions in need of answers before making a purchase. In addition, avoid having a corner of a rug leading into the threshold of another room; such placement may facilitate tripping or falling. Some people have difficulty arranging modern rugs in association with coffee tables and adjacent sofas, chairs, and loveseats. It's generally acceptable to have a rug encompass the coffee table area and that of the front legs of nearby furniture. In most cases, a purchased rug will not encompass a coffee table in addition to surrounding furniture; so, it is acceptable to run the carpet along the front half of furniture while letting the backend rest on the uncarpeted floor. Celebrants of modern rugs love seeing them in places where no other furniture is present. Think of placing rugs in front of a fireplace, bookcase, or sink, as well as in the middle of a spacious room. Modern rugs are home implements, offering owners a lot of decoration opportunity. Do something different. The floor is not the only acceptable place to find modern rugs in a living space. Some decorators opt for wall placement. Ornate, hand-knotted modern rugs usually work well on walls, emulating the look and feel of abstract paintings.